The BID Team have arranged a magical Nutcracker themed trail for visitors and shoppers to the city to encourage dwell time and footflow. 10 oversized (6ft tall) Nutcracker Kings will be guarding various locations around the city centre. The trail has been devised to take people around both main and side streets, and can be completed in any order. 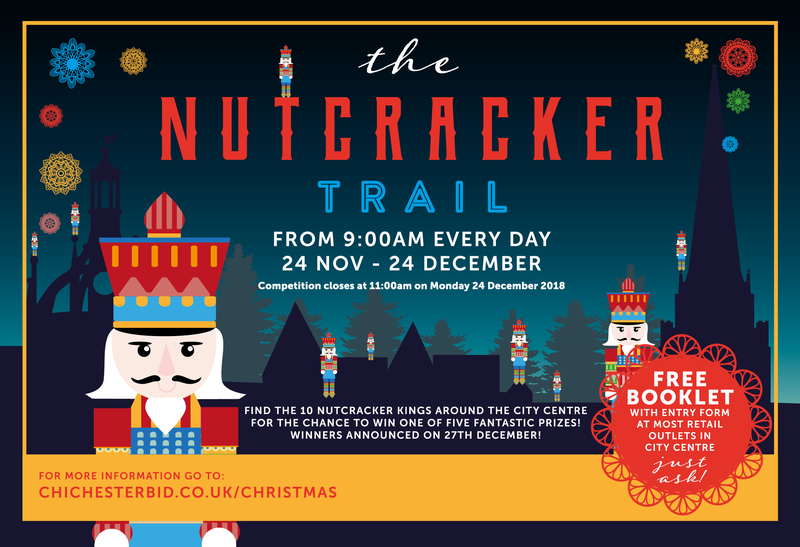 All the participants need to do is locate ALL 10 Nutcracker Kings and note down their names on the form inside the specially produced FREE Nutcracker Trail booklet to be in with a chance of winning one of 5 extra special prizes. The trail runs from 24th November to 24th December so there’s plenty of time to get entries in. The trail can be picked up at any time, it can be done all in one go or completed over a few visits – the choice is completely up to the trail finders. 5,000 free trail booklets will be printed and distributed to all shops so that you can hand them out to your customers and get as many people engaged as possible. Perfectly timed: There will be a lot of media surrounding the new Disney Nutcracker Film, and we can look forward to Chichester Festival Theatre’s production of the tale by the Moscow City Ballet too. NB: Our Nutcracker Kings will only be on guard during city centre business hours. Drapers Yard (Nutcracker King no.10) is Closed Sundays and Mondays, entries can be posted or dropped off to Chichester BID at 82 North Street, Chichester. PO19 1LQ or into Clothkits, The Hornet, Chichester. PO19 7JG. Our Jam Packed Christmas Update!